Tapwage is the Career Discovery Engine. We help candidates discover millions of jobs, internships and careers at Startups, Fortune 500, Tech & Media Companies, globally. Search, filter, and discover using the industry’s most advanced matching and intelligence algorithms. Job Channels make it easy to explore new career options. Ever wondered what types of internships you can do on Wall Street? We have a channel for that. Want to work on amazingly difficult problems at companies trying to change the world? We have a channel for that too. Looking for an entry-level job in Hollywood, or a strategy job at a startup? We have you covered. With hundreds of Career Channels (and more added every day) you can stop searching for a job and start discovering your career. Sign Up (it’s free and will only take a few seconds), subscribe to your favorite Career Channels and get notified as amazing new jobs are available. Don’t know where to start when searching for a job? You’re not alone. Navigating corporate jargon and internal job titles can make job search feel more like a dumpster dive. Use Tapwage to filter jobs by experience, qualifications and interest to find opportunities you’ll love. We have hundreds of tags across several categories: Job type tags denote experience levels (like senior or junior) and qualifications like MBA or PhD; Interest tags cover a range of interest like programming, or strategy, or photography; Company tags focus on different types of companies like Fortune 500 companies, Startups, Wall Street, Hollywood, and Non-profits. Select a tag and begin discovering your career. 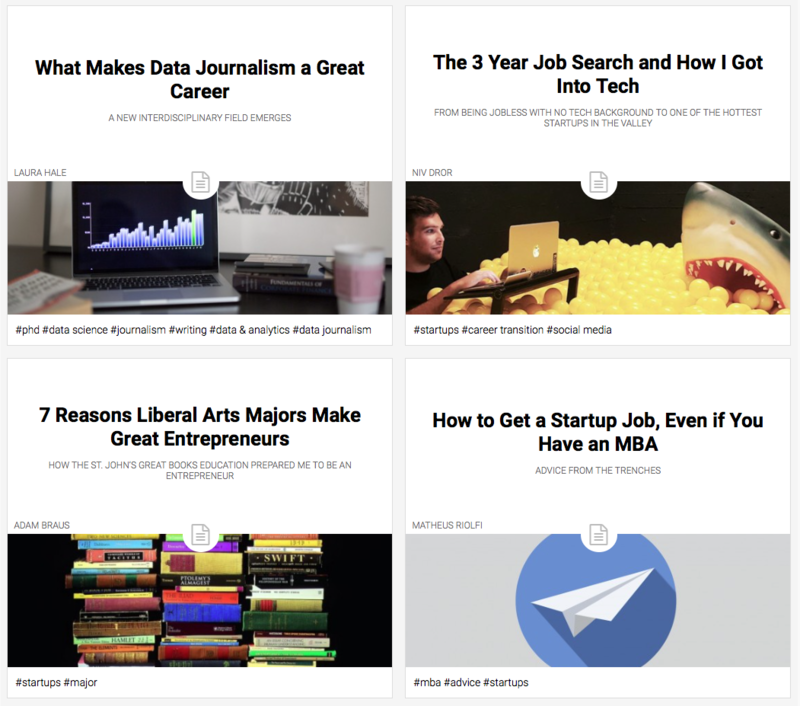 We have hundreds of articles and career resources to help you discover your career, master the job search and climb the ladder of success. Our contributors have been in your shoes and have practical tips on choosing careers and navigating every step of recruiting. Whether you are breaking into a career at startups, or are interviewing at Facebook, or are trying to make your internship count, we have advice on how to help you achieve your goals. We leverage our experience by helping employers write perfect job descriptions that attract a more diverse and qualified candidate pool, faster. Check out TapRecruit, our smart job description editor. Apply here to have your company’s job board included in our Career Discovery Engine. Tapwage uses proprietary algorithms to index jobs directly from company sites and trusted sources daily. We apply artificial intelligence and natural language processing algorithms to clean-up, analyze, tag and curate jobs in a way that makes it easier for candidates to find and explore them. Train our algorithms to learn what you like and what you don’t, just by using the site.